The 2017 monsoon has been all about the floods. Parts of Gujarat, Rajasthan, Assam, Bihar and Bengaluru have all been inundated by reportedly historic levels of floodwater following incessant rainfall during the season. At least 11 states have experienced floods since the onset of monsoon in June. 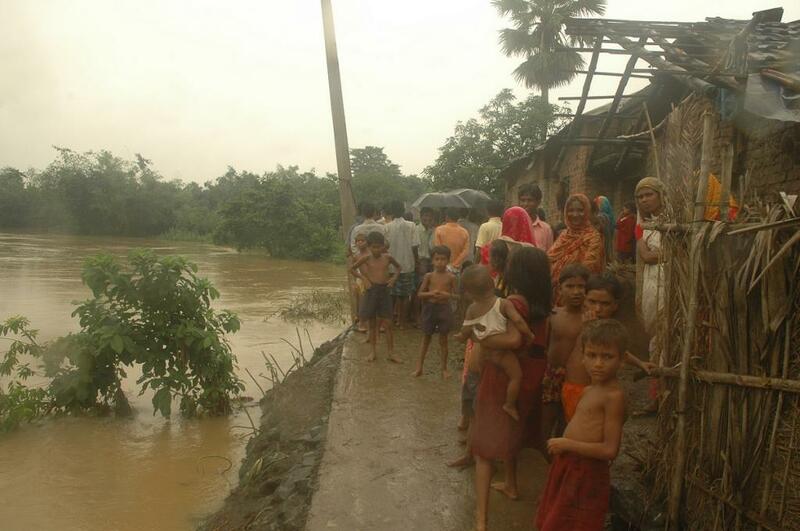 Nearly 150 districts have already received more than 100mm of rains in a single day. But as we roll into the fourth quarter of the monsoon, around 40 per cent of the districts have had deficient rains. Parts of states across north, central and south India are bracing for a drought over the next year. A look at the distribution map issued by IMD reveals a corridor of red right along the country’s north-south axis. According to the met department’s current weather status and two-week outlook, rainfall over the country as a whole has been normal—four per cent below the long-term average. Rainfall in all four geographical regions is within the margins of “normal”. A closer look at the distribution and the patterns of rainfall show that the monsoon has actually been anything but normal. Temporal distribution all over the country has been all over the place. The IMD issues week-by-week observations of rainfall activity categorised according to the quantum of rain received during the week. So far about 400 weekly observations from 36 meteorological sub-divisions have been listed. Less than a fourth of these fall under the normal category, and yet rainfall over the country as a whole is normal. Extreme rain has compensated (and in some cases over compensated) striking deficiencies in other weeks, indicating a contraction in the distribution of rains this year. Rajasthan is a glaring example. The state currently registers an excess rainfall of about 23 per cent. West Rajasthan received more than three times its normal rainfall between June 20 and August 2. Most of this was received by incessant rains over Rajasthan, Saurashtra and Gujarat between June 24 and 28. Apart from these few rainy days, there have been fewer than usual rainy days. The Gujarat subdivision has seen four weeks when rainfall exceeded the normal levels by more than 50 per cent, two weeks when it exceeded the normal by more than 20 per cent and five weeks when rainfall was deficient by more than 60 per cent, according to the weekly normal. During these eleven weeks, not a single week has registered normal rainfall. A similar story can be told of Suarashtra and Kutch, too. Heavier rains over fewer days have propped up overall figures in several states, including Bihar, Jharkhand, Odisha and West Bengal. In stark contrast, rain-rich regions of Kerala and coastal Karnataka have received deficient rainfall while the rain shadow regions in southern Tamil Nadu have received rains far above normal, thanks to heavy rains in August. The situation in Maharashtra is yet another failure where drought-prone Marathwada and Vidarbha witnessed 32 and 28 per cent deficits respectively. Farmers have been particularly affected due to significant levels of moisture stress following a near complete failure of monsoon this year. After two weeks of strong pre-monsoon showers in June, farmers faced heavy deficits in seven out of nine weeks (five weeks saw more than 60 per cent deficit). Despite a third wave of floods ongoing in Assam and excesses in Tripura and Mizoram, Manipur has received less than half of its normal rainfall. Back in April, the IMD’s first long-range forecast showed a “normal” 2017 monsoon. They reiterated their belief in the update to the forecast, issued in the beginning of June. If the monsoon ends with similar numbers, the prediction will be counted as a success when IMD comes out with forecasts in future. While this might boost the met department’s credibility, it also raises serious questions about how we understand and classify our monsoons. As much as IMD’s claim stands vindicated, its errors are also revealed. Both long-range forecasts were criticised for large margins of errors and inconclusive probabilities on which the forecasts rested. The current monsoon is challenging India’s conventional simplistic nomenclature when describing complex global circulations like the monsoon. Depending only on quantity of rainfall to describe monsoon performance without accounting for distribution and influential atmospheric conditions would again lead to misreading of monsoon.